Scythe presents the Easy Mobile Rack, a new device that enables the installation of one 3.5" HDD into a 5.25" drive bay. The product should be available for around 8.25EUR (excl. VAT). Japanese cooling expert Scythe proudly presents its' newest product in the field of PC Accessories. Scythe Easy Mobile Rack is an easy Mounting-Bay for 3,5” HDDs which is meant to be installed into a vacant 5,25” Bay. New Scythe Easy Mobile Rack comes in an elegant black colored design allowing it to fit into a wide range of on-market PC chassis. Installation of Scythe Easy Mobile Rack is really easy. It only has to be placed into a vacant 5,25” Bay of the PC chassis and secured by several screws, similar to the installation of an optical (CD, DVD or Bluray) Drive. The required 8 screws are, typically for Scythe, included in the Package of the Scythe Easy Mobile Rack. 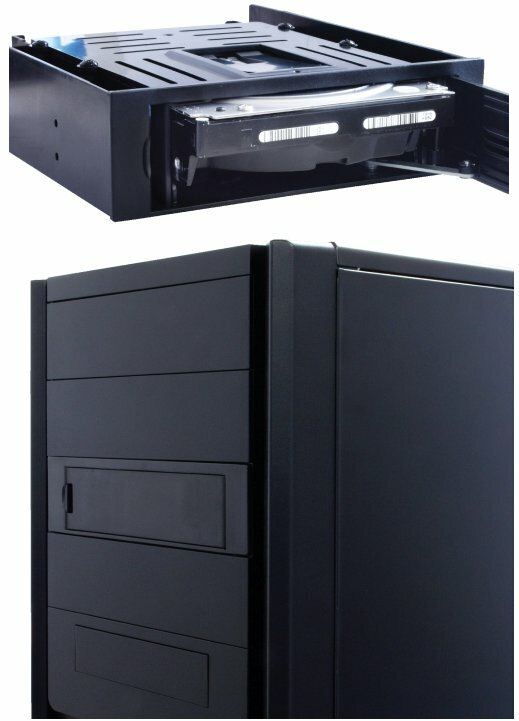 After the Easy Mobile Rack is installed, user only have to connect one S-ATA Power Cable from the Power Supply Unit and one S-ATA Data Cable from the Mainboard to the back side of the Easy Mobile Rack. As soon as the installation is completed, users can plug-in a 3,5” Hard Drive right away without any additional work. Thanks to its Hot Plug support, Scythe Easy Mobile Rack allows removal and insertion of Hard Drives even while the PC is running. As known from Scythe, a comfortable user experience was one of the main goals during the development process of the Easy Mobile Rack. A mechanism, connected to the hatch, supports an easy and tool-free insertion or removal of Hard Drives. With its dimension of 148,5 x 42,5 x 177 mm and weight of 180 g Easy Mobile Rack is designed to fit into a single 5,25” Bay and align seamlessly with the PC Chassis.